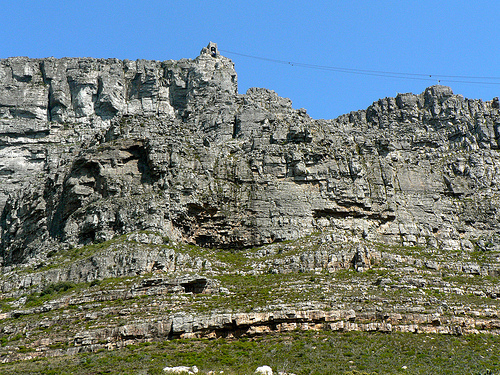 Cape Town's Table Mountain defines the sky line from almost anywhere in the city. It's a beautiful vertical escarpment that projects straight-up, the city wrapping around it below. The city follows the Capes shoreline and butts up against the mountain so it's a constant landmark. Enjoying the views from the top of the mountain has to be at the top of list for any visitor to Cape Town. In February I had the opportunity to climb it, for a wonderful day of adventure. My trip to South Africa for business had me landing early on the Sunday which gave me the rest of the day free. The goal was to find something close to the city, outdoors and fun. After some research I found David Vallet a certified climbing guide. 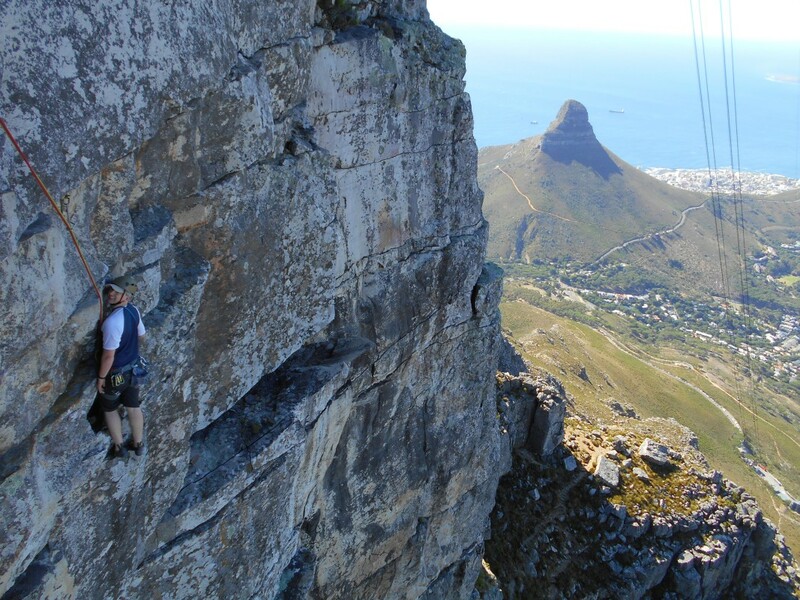 He suggested a couple of possibilities, recommending climbing the world-class limestone of Table Mountain. Although I'm not much of a trad climber it sounded like a perfect adventure - accessible, beautiful and with a cable car! For much of the flight to South Africa I tried to find ways to keep my feet from inflating. I'm sure the person in front of me appreciated my wriggling and standing-up! Slightly beaten-up from the flight (and not by the passenger) I rushed off the flight and grabbed a taxi to the cable car station to meet up with David. We chatted on the way up, and I discovered that he'd done a host of climbing around the world and had recently been working on some climbing films. It's always good to hear your guide has a range of experience before you put your life in his/her hands! 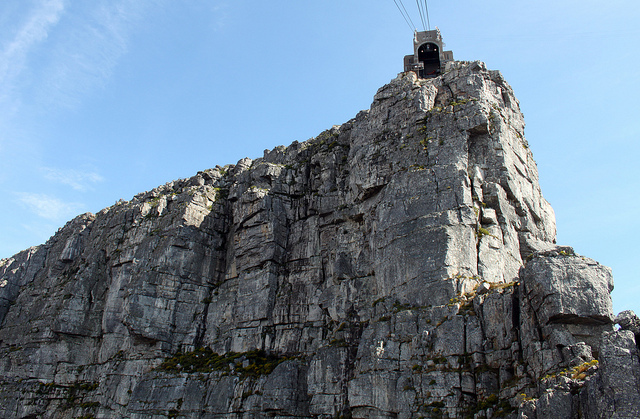 As we only had a half-day the first thing was to abseil down from behind the cable car station to the bottom). It's not really my idea of a perfect way to start working with a guide, but the abseil anchors were well set. The free-hanging abseil freaked me out a bit as I don't do them that often and the wind gently blowing me around definitely got the senses working! We were soon at the bottom of Africa Wall. Now the moment of truth - can I get my climbing shoes on - yes, OK good! Excited and ready to go, the first pitch proved a bit of a shock to the system! It had been months since I'd been on actual rock and as usual it took my brain a while to figure out what was happening. 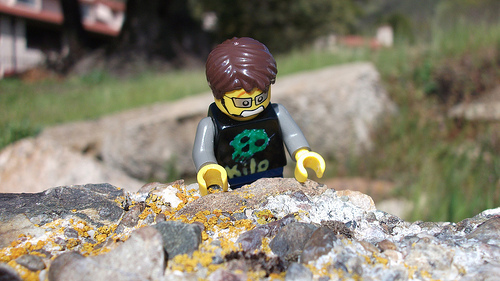 Reminding myself not to worry, my attention was quickly grabbed by the quality of the rock. A beautiful limestone, smooth and vertical with good horizontal breaks and fantastic friction. It was clear the Cam placements were great and they felt very secure. I appreciate beautiful engineering and find Cams deeply reassuring. Early on we came to a corner crack that caused some angst. It didn't look that difficult but if you train indoors a lot of the time then something you don't get to practise that much is corners. Particularly ones without that many handholds. David was fantastic offering lots of advice on where the holds were and how to move around the chimney. At one point he asked if I wanted "less beta". I reassured him that I had no qualms at all about hearing the best way to do things. Reminding myself to trust my feet, and with a fair amount of huffing and puffing I made it through the section. Breathless and surprised I made it to the stance and took a rest. As a social animal my first concern was the 'embarrassment of finding it hard', that self-limiting worry. Seemingly, a left over sense from our ancient forebears who for some reason thought it important to look good while being eaten by a sabre tooth tiger! "But, it's only a 4, I should be able to handle it easily" my inner monologue ran. Quickly looking around I realised that as we were half way up the mountain there was no-one around, so no-one would know! Well, except for the Guide, and I'm pretty sure it's their stock in trade seeing people flip out. So reminding myself of the numerous "factors" impacting my performance. Just the start of my personal list being - that I'd just got off a plane, don't climb trad, hadn't eaten, was too hot, had the wrong shoes and that I didn't have my lucky underpants. Having got the mental excused out the way, I resolved to continue, stop worrying and focus on enjoying! The next few pitches were more vertical as we got into the heart of the wall (Atlantic Crag). As we were trad climbing I had to remove the gear from the pitch and take apart the belay points. There was plenty of time to rest as David climbed on lead, letting me have a sit down, take on water or some snacks. I slowly got back into balance, found my groove and started really enjoying it. The views from the ledges got more and more spectacular as we made our way up, revealing more of the city and the surrounding plain right back towards the Cederberg(?) mountains in the interior. 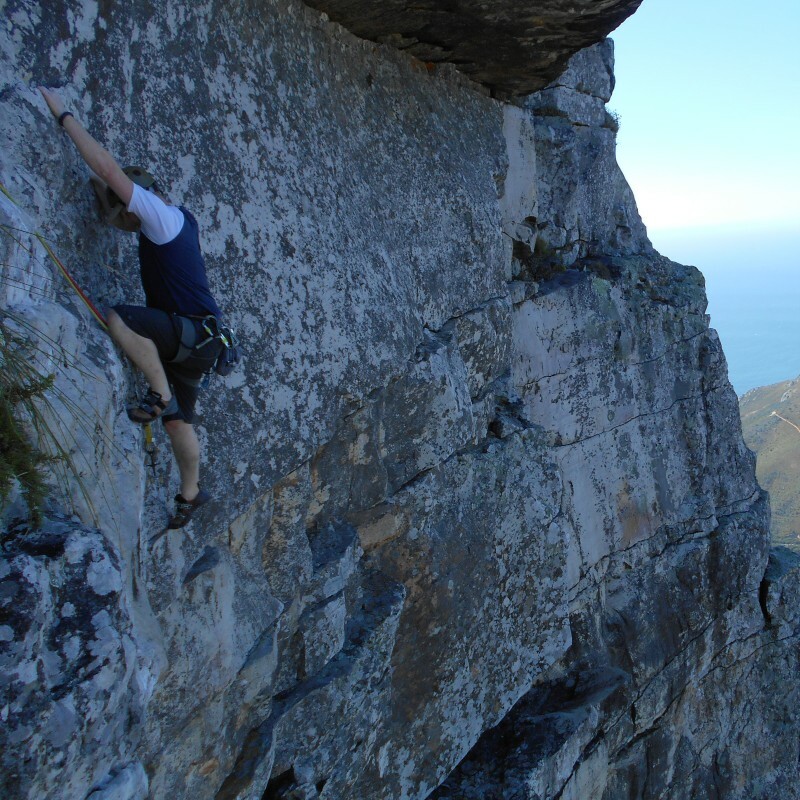 The rock on Table Mountain makes for interesting climbing, it's smooth but with nice friction and forms perfect jug hand and foot holds. It made for indoor gym-like climbing with plenty of reassurance. Multi-pitch is all about stamina so I was very happy to take a rest at the belays and recharge as I started to feel the tiredness from the flight. The views out to sea and across to Signal Hill got better and better. The crux of the route is pretty close to the top (pitch 6) and consists of a roof that you have to climb over. David went ahead and got himself set-up on top of it. Having come down a bit he could lean out to see below it to offer advice - a bit freaky to have someone telling you what to do from (seemingly) just behind the back of your head but it was effective! To start the pitch I had to traverse out from a great ledge across to the right with low hands. Then there was a really high reach to a hidden hold that I pulled up on through to a semi-lock, then it was up and a pull across as fast as possible. Finally, I had to traverse back along left, across what is now the top of the roof. No way I could have found the holds, let alone done it without David's advice - but with some encouragement and a bit of jaw clamping the goal was achieved. It was only a few feet, but a great set of moves, a real bouldering problem and brilliant fun. The last pitch was probably a 3+ , but it was right next to the cable car. As David departed he told me to "style it out" which left me wondering. As I moved up the cable car came past and some excited tourists "oohed" and one cheered - now I understood! Of course, you could walk up it, but I took the compliment with a wave and tried to make it look moderately hard - my sketchy and tired legs made that easy! Finally, I made the top and got to enjoy the view along the edge of the escarpment with the wall running along below. It was a fantastic day of climbing with great moves, beautiful rock and you can't beat those views! Thanks to David for great guiding and relaxed company. All I can say is if you get the opportunity to climb Table Mountain, grab it - and remember to style it out!